A woman bites into a burger. Kuwait's enthusiasm for fast food is contributing to its obesity problem. (CNN) -- In Kuwait, at family gatherings and social events, food is always at the top of the menu. 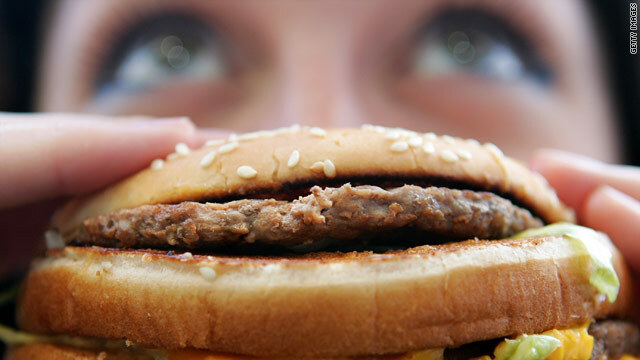 Friends meet at restaurants two or three times a week and if you don't want to go out, Western fast food chains like Burger King will deliver tasty, high-fat meals to your front door. At family occasions, the more opulent the spread the greater the social status conferred. Tables groan under the weight of multi-course banquets laid on by competitive hostesses, often aided by maids. But, in the oil-rich Gulf state where scorching summers keep people indoors, this appetite for excess is taking its toll. Kuwait is one of the fattest nations on earth -- and it is affecting people's health. Just over 74 percent of the population is overweight, according to the World Health Organization (WHO) and this "obesity epidemic" is contributing to a rise in heart disease and diabetes. The populace of Kuwait is very much enjoying the home delivery revolution. WHO says around 14 percent of Kuwaitis currently suffer from diabetes and it is on the rise. "[Being] overweight and obesity have been gradually increasing for the past 15 years," Nawal Al Hamad, Head of Nutrition at Kuwait's Ministry of Health, told CNN. The underlying causes are complex, but an abundance of food and sedentary lifestyles are major factors, according to Hamad. "In Kuwait incomes are good, food is available and not very expensive, and most importantly people don't move a lot," she said. "Our homes are equipped with the usual advanced technology devices, in addition to the fact that we have helpers at home; even people who are unemployed usually have at least one or two helpers at home," she added. Kuwait's per-capita wealth is one of the highest in the world, while over half the labor force is made up of non-Kuwaitis, according to the CIA World Factbook. Sami Al Bader is head nutritionist at Gethealthykuwait.com (GHK), a private initiative aimed at helping Kuwaitis to lose weight. "The figures of overweight people we've reached in the last five years are very alarming," he told CNN. What's more, GHK has discovered high obesity rates in children. Just under half of female students are overweight and type-two diabetes -- once known as adult-onset diabetes -- is now affecting children as young as eight. Bader said the importance of food at Kuwaiti social functions is contributing to the country's weight problem. "The new Kuwaiti psyche is very heavily related to restaurants and eating out," he told CNN. "At family gatherings food is the number one thing. Every family occasion in Kuwait is like Thanksgiving. "The more food you present gives you a bit more status, so people are always presenting more food at all the different occasions," Bader said. He added that over the past 20 years more Western products have arrived in the country -- including Western-style fast food. "In residential areas there are fast food outlets around your homes," agrees Hamad. "It is easy to access, whereas when I was young I couldn't find it in a residential area," she said. Home-delivered fast food is popular. Some McDonald's branches offer office-delivery and Burger King and KFC deliver direct to customers' front doors. "The sheer number of delivery trucks competing in traffic jams in Kuwait tells me that the populace of Kuwait is very much enjoying the home delivery revolution," Sumayyah Meehan, an American journalist who has lived in Kuwait for the past 14 years, told CNN. Meehan recently succumbed to the temptations of home deliveries. "This past year I found myself on the brink of obesity. I completely indulged in the fast-food lifestyle prevalent in Kuwait and a great part of that included home delivery," she said. Some of the problems Kuwaitis face are down to the hot summers and a lack of alternative activities, according to Meehan. "There is not much to do in Kuwait besides going shopping and eating out. The scorching hot summers leave most of Kuwait's populous languishing at home or racing to the nearest air-conditioned mall," she said. And the malls -- as well as schools and offices -- are where GHK hopes to catch Kuwaitis with teams of dieticians who weigh people and give free blood-sugar and cholesterol tests. GHK is also working with children. The government, represented by the National Committee for the Prevention of Obesity is also putting healthy food into school canteens, encouraging sport and educating pupils about nutrition. The aim is to get the next generation of Kuwaitis into healthy habits they'll carry into adulthood. "It's difficult to change attitudes towards food when [people are] over 45 or 50 years of age," said Hamad. "That's why we're targeting the younger generation. When you start when they are young, maybe they will change."